Not yet prepared for my McKinsey PEI - can I postpone my interviews? >> Get Full eBook now for only $97! Can I pause for 60 seconds at the start of my McKinsey PEI? McKinsey PEI – Any difference between conflict and disagreement? Not yet prepared for my McKinsey PEI – can I postpone my interviews? Is it OK to re-position your McKinsey PEI stories, or better have new ones? Is it possible to postpone the planned interview date, once agreed with McKinsey? If so, does it have any negative consequences for my application? To cut a long story short: Yes, it’s definitely possible to re-schedule/postpone a planned interview date. Quite a few of my coaching candidates actually did this already after a coaching session recognizing the harsh truth and difficulty of McKinsey cases and the Personal Experience Interview. If you think about it, McKinsey invests quite a lot of money into your interviews (mostly considering the opportunity costs of consultants spending time with you, but also travel cost etc.) – it’s just a waste of money, brains and time for both you and McKinsey if you show up to interviews, knowing you are not yet prepared well enough. So it just makes sense – no negative consequences for your application. In addition, I have had candidates even already being on-site for their interviews but not being perfectly healthy (like having caught a cold etc.) – in this case even the interviewer sent the candidate back home and McKinsey asked the candidate to reschedule the interviews, because the candidates were definitely not in their best shape. And McKinsey definitely wants to see the very best from you. The only recommendation I give in addition is to think of a solid and clear argumentation why your preparation is lacking behind in time – most likely you won’t even need it, but be prepared just in case. If you postpone your interviews, also be prepared it might take quite while to get a new interview slot – depending on geographic region and recruiting seasonality. 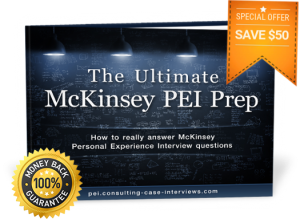 You can find much more information how to succeed in your McKinsey PEI in The Ultimate McKinsey PEI Prep eBook! Or looking for some McKinsey PEI Coaching? Click here! GET EBOOK SPECIAL OFFER now for only $97! Previous Previous post: Is it OK to re-position your McKinsey PEI stories, or better have new ones? Next Next post: McKinsey PEI – Any difference between conflict and disagreement?